Alright you code junkies! Stop jittering around, I have your fix. 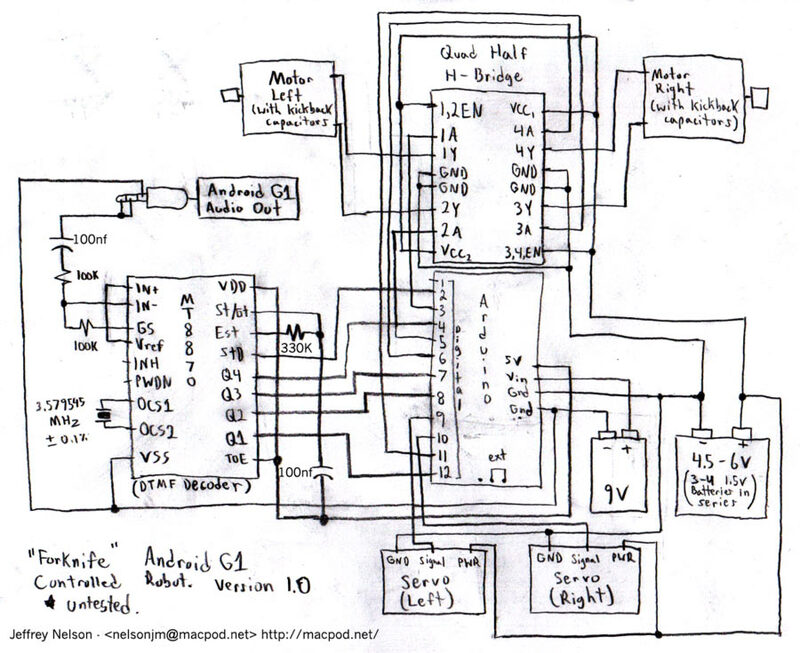 You can download the source code below and also view my crudely drawn schematic of the robot! But don't laugh, I was a CS Major, electronics is just a new hobby of mine. Here is a crudely drawn schematic of the robot. The proto-shield is an accessory for the Arduino, not a part of the Arduinome. It comes with the Arduino sraettr pack and is used in the tutorials I mentioned. I would get the arduino sraettr pack first and do those tutorials. The only other part I've ordered thus far is the Machine Collective enclosure. I'm holding off on ordering buttons, leds, etc from Sparkfun as I still need to decide whether to attempt building an RGB Arduinome. really impressive. I am trying to get started with my new arduino, this project inspired me. I like the use of the dtmf decoder. This could really open up a lot of possibilities. I'm imagining something like a remote car starter that is activated by a phone call to a dedicated pre-pay cell phone. Kinda off topic, but nice work. Admin: I'm glad it inspired you! Check out arduino.cc (especially their playground) , sparkfun.com, www.epanorama.net, ladyada.net, and letsmakerobots.com, too! I always find stuff (especially from the first two) among other places that makes me daydream.